Get ready for a whole new virtual world. Apple will be bringing thousands of augmented reality apps to your smartphone when the tech giant rolls out its iOS 11 update, which is expected to come later this month. Augmented reality — AR for short — takes the digital world and brings it together with your physical environment all in one place. AR has been around for a while, but its latest incarnation is making it accessible to the masses — and all you need is an iPhone. 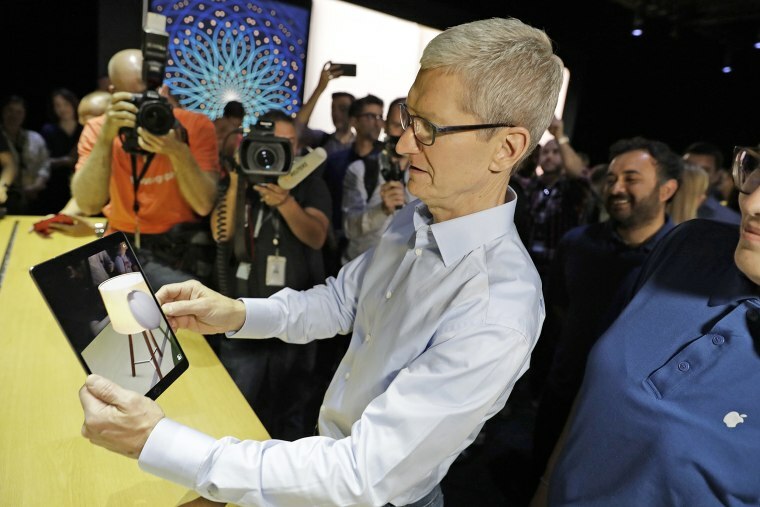 During a Utah Tech Tour last year, Apple CEO Tim Cook said he believed augmented reality would one day become as essential as "eating three meals a day" — though he warned that mass adoption could take a while. "It will happen in a big way, and we will wonder when it does, kind of how we wonder how we live without our phone today," Cook said, according to Business Insider. While it's unclear just how many AR apps will be coming out right away, some reports have suggested the number will be in the thousands. "AR will take a massive investment to make it compelling, easy to use and pervasive. Given both Apple and Google are 'all-in,' AR will likely be here sooner rather than later," Patrick Moorhead, principal analyst at Moor Insights & Strategy, told NBC News. He added that Microsoft helped lead the charge with its augmented reality HoloLens eyewear. Remember the "Pokemon Go" craze that launched last year? Hunting for Pikachu and Charmander in a real-world environment is a prime example of augmented reality being used to entertain. But there are practical uses, also. Ahead of the release, some developers and big brands have been showing off their AR apps to generate excitement. Ikea has a new augmented reality app that will let potential customers view digital furniture in their real-life space to design their dream living room. If you like what you see, Ikea will let you order straight from the app. If you're having trouble deciding what to order, there's also an app for that. A demo for one app shows how restaurants can make digital burgers and desserts appear on your plate to help you make a decision. Expect to hear more about augmented reality on September 12 at Apple's big iPhone event. Apple isn't alone in the quest to bring AR to the masses. Last month, Google released its ARCore platform to developers looking to create augmented reality experiences for Android. ARCore is available now and will run on the Pixel and Samsung S8, as long as the devices are running the Nougat operating system or newer. Google said it hopes to have ARCore on 100 million devices by the end of its preview.